It’s no secret that I’ve long been a big fan of Audioengine’s speakers. They were a sponsor of Coverville for quite some time, and during our relationship, I got to try out a few of their flagship products, and I was always amazed by their quality and their sound output. So when they announced that they were adding a new bluetooth receiver to their line-up, I was really eager to put it through its paces. 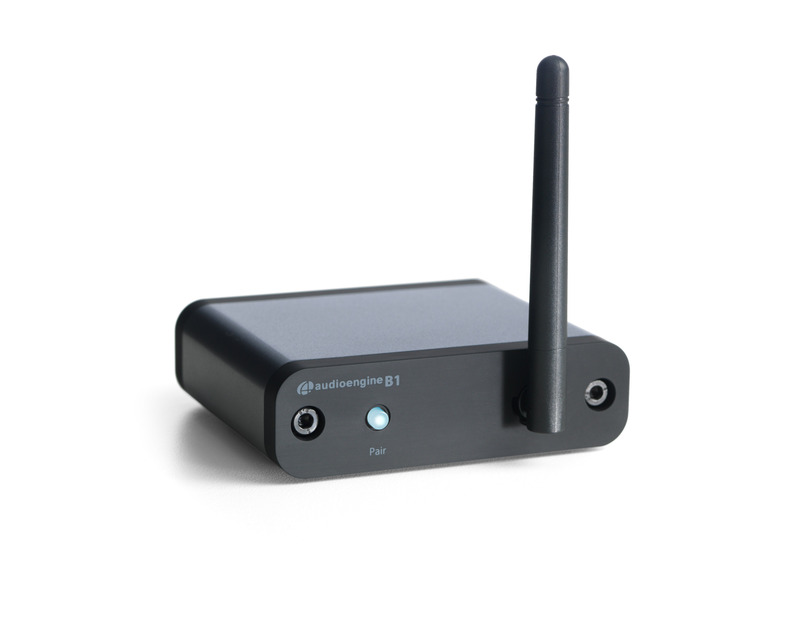 This is a tool for wirelessly getting the sound from your bluetooth-compatible audio device (desktop, laptop, smartphone or tablet) delivered to a stereo system, speaker or other component. Using this, for example, you can send music from your smartphone to your living room’s stereo system, for high-fidelity enjoyment of your favorite tunes. You could also use it to blast the sound from the movie you’re watching on your tablet out to a set of outdoor speakers. The device itself is slightly thicker than a deck of cards, but about the same length, and square. It has an antenna for extended reach, and audio ports on the back, as well as a standard USB port for power. Audio from the unit can be output via standard left and right RCA-style jacks, which are ready to roll for most stereo component inputs, and can be easily converted (using the included Y-cable) to a 1/8th-inch headphone cable for portable speakers and similar devices. For more modern stereo setups, an optical output is also available. As with their speakers, Audioengine thinks of everything you could possibly need, and includes it in the box, from the USB cable you’d expect, to the power adapter you’ll need if you want to plug it into a wall socket. And of course, they include a red/white RCA audio cable, and a well-made fabric drawstring pouch to keep it all in. This above-and-beyond level of generosity and forethought has always been one of Audioengine’s hallmarks, and it’s good to see that they continue it here too. The build of the unit is completely solid. Like all of Audioengine’s other products, you don’t get a cheap piece of flimsy plastic, you get a well-made, solid and durable unit, that you won’t have to worry about in a travel bag of other items. For anyone who has ever connected anything via Bluetooth, you’ll find the setup at the same level of ease. Putting the B1 into pairing mode involves holding down the power button for a few seconds, and then selecting it in your device’s Bluetooth settings. Once paired, the B1 can be selected like any other sound source, and switching to the device is instantaneous. Whether it’s due to the B1’s added antenna, or just its design, I found the range to be extremely impressive. Connecting the device to a Sony outdoor amplifier on my porch, I found that the music played, uninterrupted, as I grabbed a few items from different rooms in my house, wirelessly sent from the iPhone in my pocket. It wasn’t until I came back out to the porch and talked to my guests that I realized I had walked off with the source of the audio. Never hearing any gaps or stutters in the music, they were completely unaware that it was all being sent via bluetooth. Like their speakers and other audio products, Audioengine excels at making a product that is both beautiful and functional. Something you’ll feel proud about displaying on top of a stereo system, an entertainment center, or with a patio speaker setup. With so many portable electronics these days produced to be disposable and quickly replaced, it’s nice to see a company that still knows that form is just as important as function. Available now. Find more details at AudioengineUSA.com, or purchase at Amazon.com or your favorite retailer.